‘Word of mouth’ has never been more important than now – in the age of Social Media. However much we spend on promoting our webinars, a simple recommendation from an influential person on social media is definitely worth more. We can spend hours being social, being careful not to be pushy about products or services, becoming everyone’s friend and that will never be wasted time but how can we make it easy for our audience – the ‘fans’, the ‘champions’ to get the word out to their own networks? 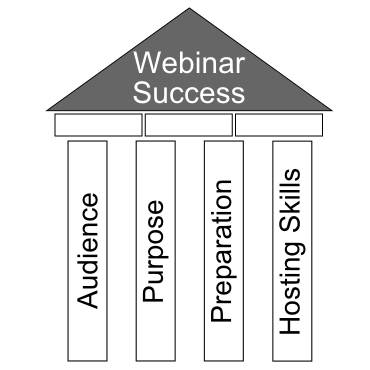 Can we rely on our audience to know how to share details of our webinars via all their social channels? I saw a feature recently on a promotional page for a Webinar which enabled all visitors to share the page to their chosen social networks – it was so simple but it struck me as powerful. It leaves nobody in doubt about how to share the details of the upcoming event. So what is the feature? The information page I saw had social sharing buttons repeated at the top and bottom of the Webinar details with a call to action to share the details. There were the same kind of buttons as you can see at the bottom of every post here on Webinar Quick Tips. Technically, if you use WordPress or another content management system, this functionality is probably already built-in or can be added simply by using a plugin. If you don’t use a CMS or yours doesn’t support this feature, you can always use systems like ShareThis which can be embedded in practically any webpage. Make it easy for your audience to share the details of your session with whatever networks they already have. This will act like a megaphone for promotion. It’s amazing how quickly your message can be spread – as you can see in this article about the journey of a tweet. So, assuming your Webinar is compelling and created according to the WQT 4 pillars of Webinar Success and the quick tips here, social share buttons will enable you to harness the power of your audience as they can easily broadcast the message for you to their existing networks.